Boy, do I have a story for you all!!! Oh where to start??? I am so excited and can barely sit still long enough to write this post. I will try not to be too wordy. :-) I will try to start from the beginning. 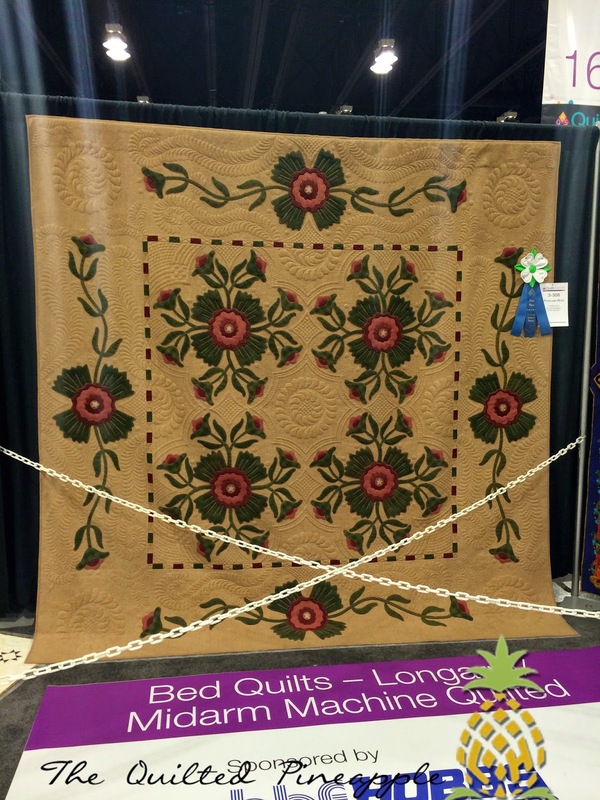 :-) Last week was Quilt Week at AQS Paducah. I made the last minute decision last month to attend the show. I have never been, but this year turned out to be extra special. 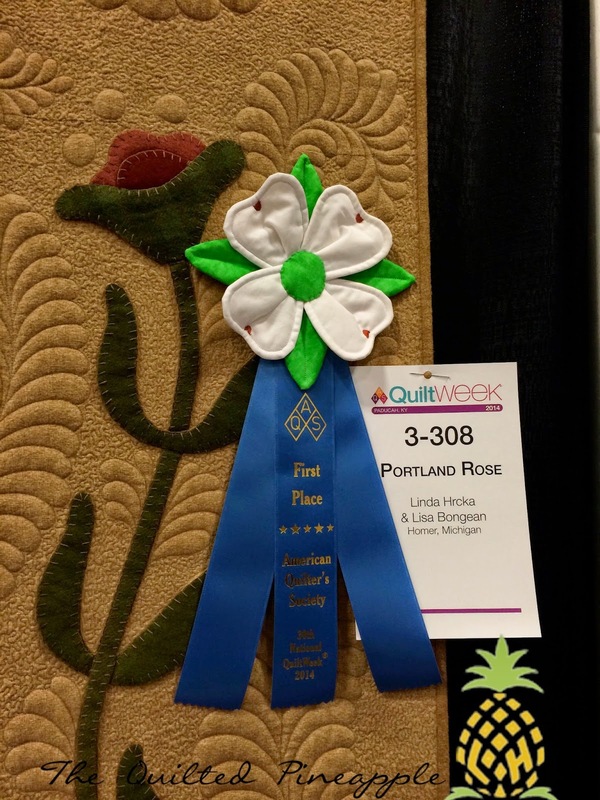 I submitted the quilt, Portland Rose on behalf of Lisa Bongean and myself and it was accepted. In addition, my friend Thelma also submitted her quilt, Done Pick'n, (pattern Door County Cherry Baskets by Lisa Bongean), which I quilted AND it was accepted!! I thought "what are the chances I will ever have TWO quilts that I quilted in Paducah at the same time ever again??" So I made the decision to make the 8 hour drive to attend the show for the experience of it all. 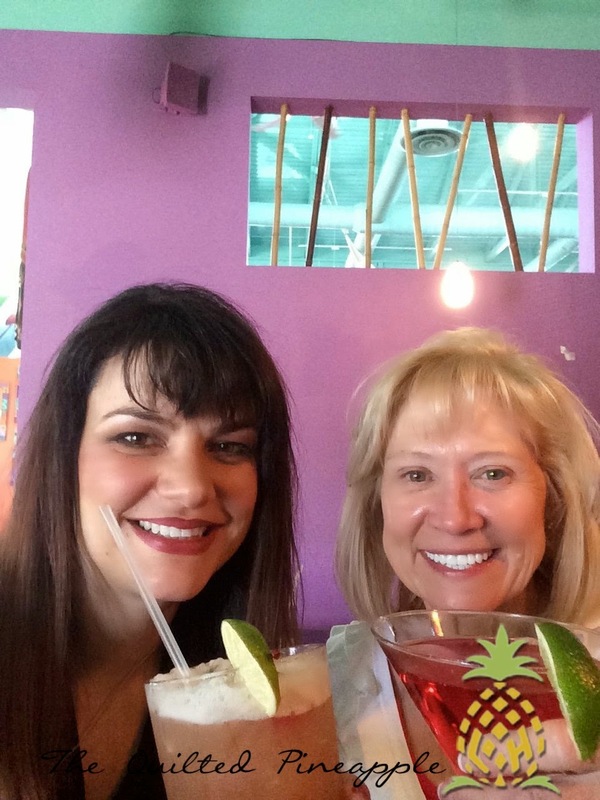 I mean doesn't every quilter have Paducah on their Bucket List?? This year was the 30th Anniversary of the Paducah Show. This was the entry into the Award Ceremony. So Cool!!! 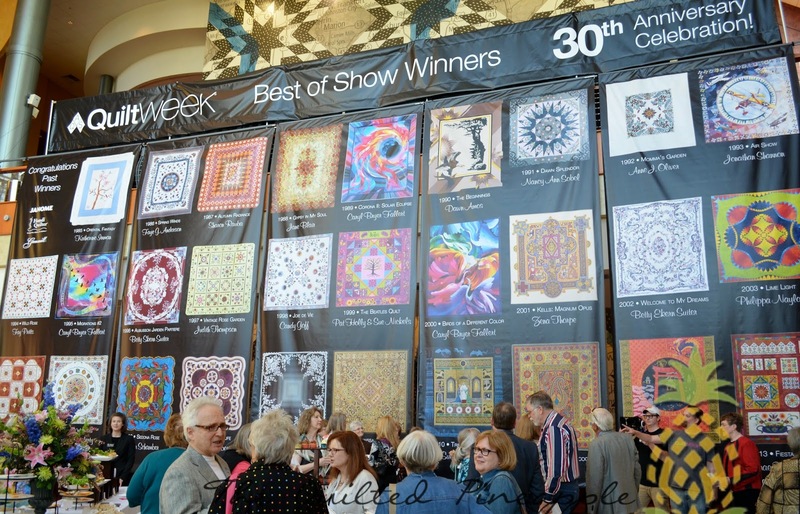 30 years of all the Best of Show Winners. Let me be clear, Thelma, (Lisa although she did not attend) and I went to the awards thinking we had NOT won. We were going for fun and to enjoy the awards, which makes this that much sweeter. We even joked that neither one of us had received a winning call. LOL!!! 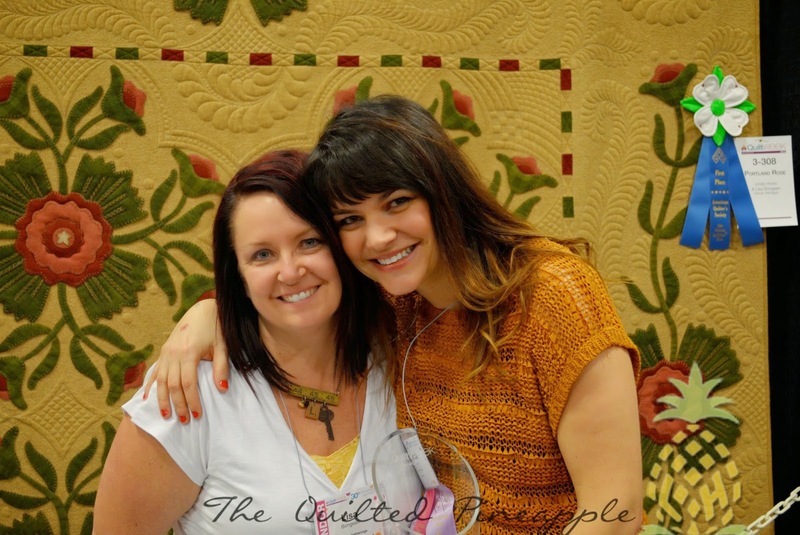 So imagine our surprise when they read through the Honorable Mentions and Thelma's quilt won!!!!! We were both squealing and crying!!!! How exciting!!!! The awards then move through the categories. 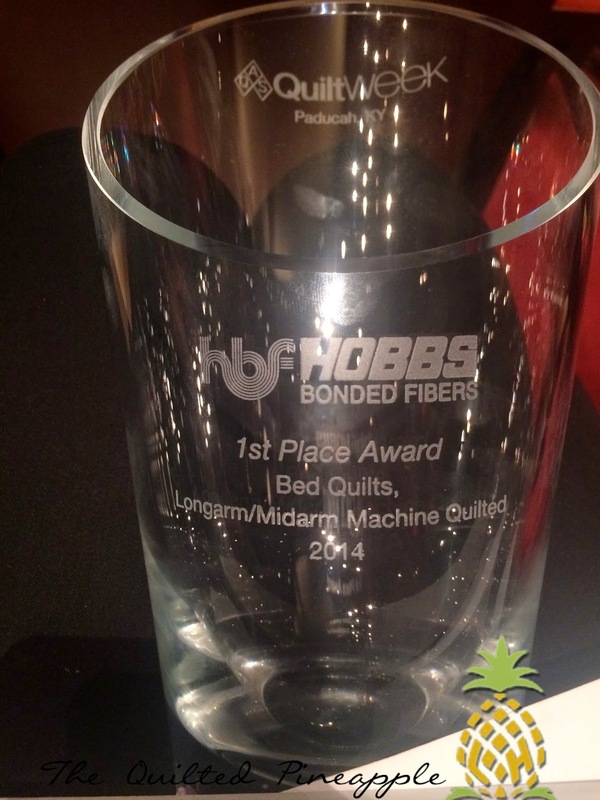 Bed quilts were last before the BIG awards. Neither one of us were prepared for the next photo. 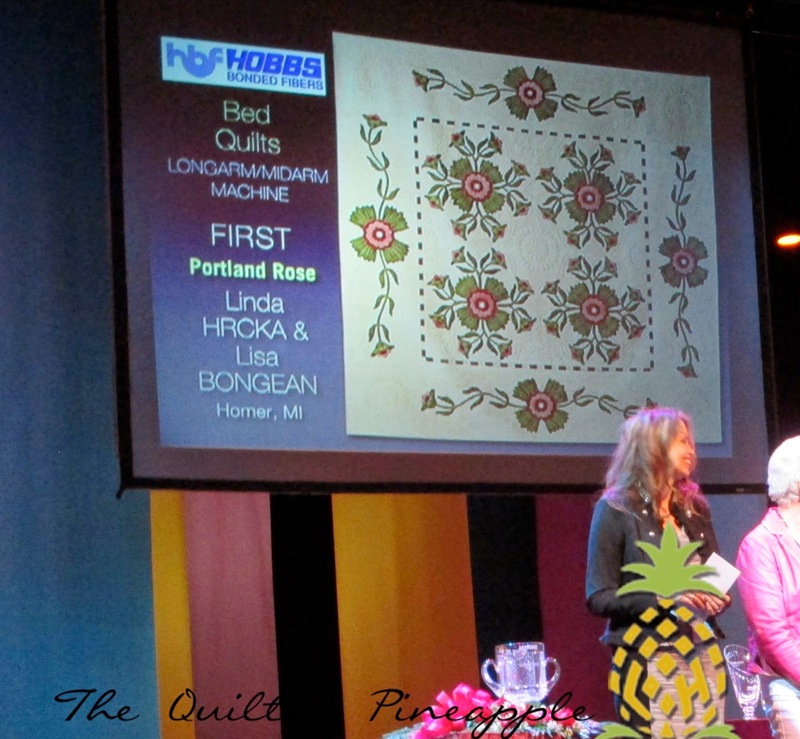 PORTLAND ROSE WON FIRST PLACE in the bed quilts Longarm/midarm category!!!!!! I never heard mine and Lisa's names called because we were screaming sooooo loud!!! Shock, surprise and crying all in one as I walked on stage to receive the "Oscar"!! Pretty sure I shook all night!!! I cannot even tell you what an amazing surprise this was!!!! I texted Lisa and she didn't believe me either!! LOL!!! I told her she better meet me over at the convention center for the preview!! I cannot tell how wonderful it is to share this with my friend and my creative other half!!! Portland Rose in all its glory!! The coveted dogwood ribbon Paducah is known for. And Done Pick'n... Thelma's impeccable work. What a night for the 3 of us!!!!!! It was magical. A night I will never ever forget. A winning combination. 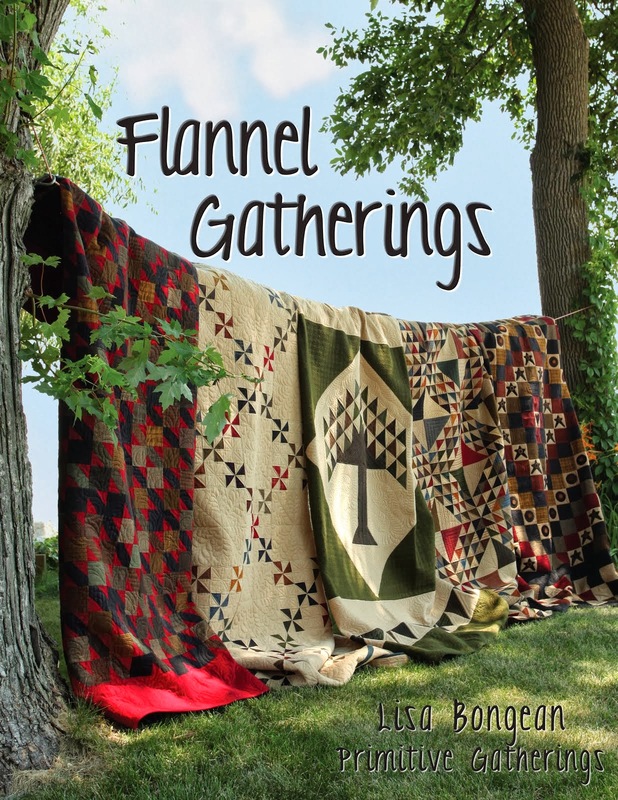 How cool is it that both quilts were designed by Lisa!!??!! 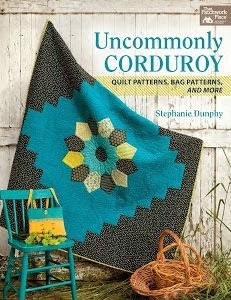 And quilted by me. 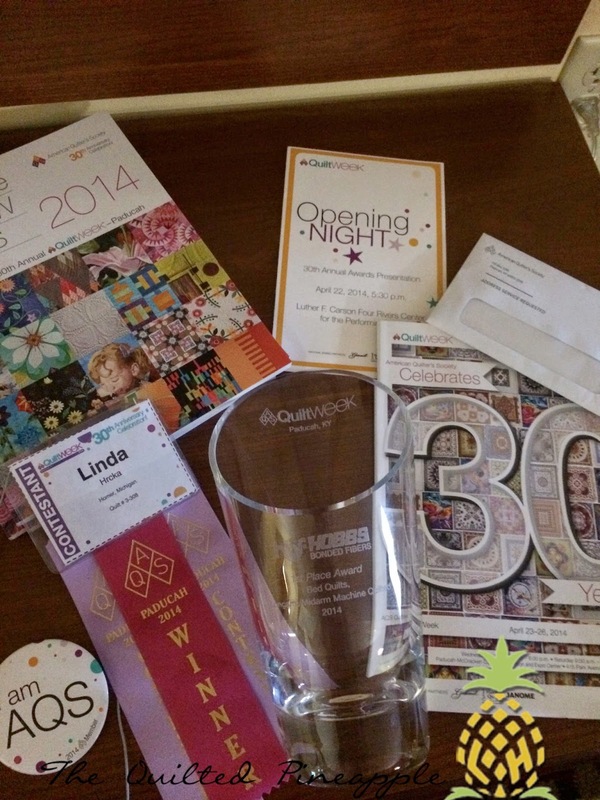 :-) We could not have been happier that our VERY traditional quilts ribboned!!! Who would have thought!?! Wednesday I spent the majority of the day hanging out in front of our quilts. 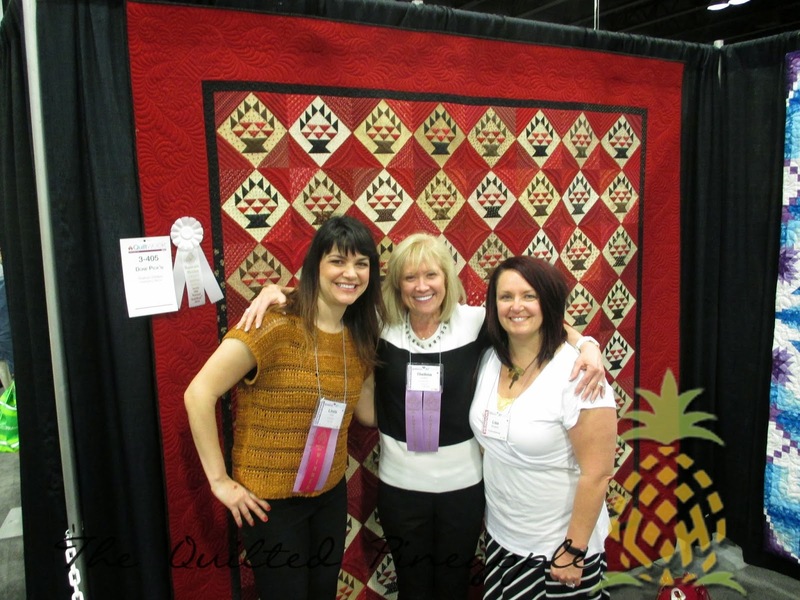 Quilters from all over the world loved to take photos with us and ask questions. I have to say EVERYONE in Paducah whether it was the other quilters in the show, visitors, AQS staff or residents, they were all wonderful!!!! It was one giant admiration fest!!! How nice is that??? You can see a complete list of the winners by clicking here. Lisa and I did some interviews as well. You can see the AQS youtube interview here shortly after we won. (listening and watching myself...yikes...lol). Honestly, this was OUR version of the Academy Awards. To be surrounded by all this talent, and to win is very humbling. 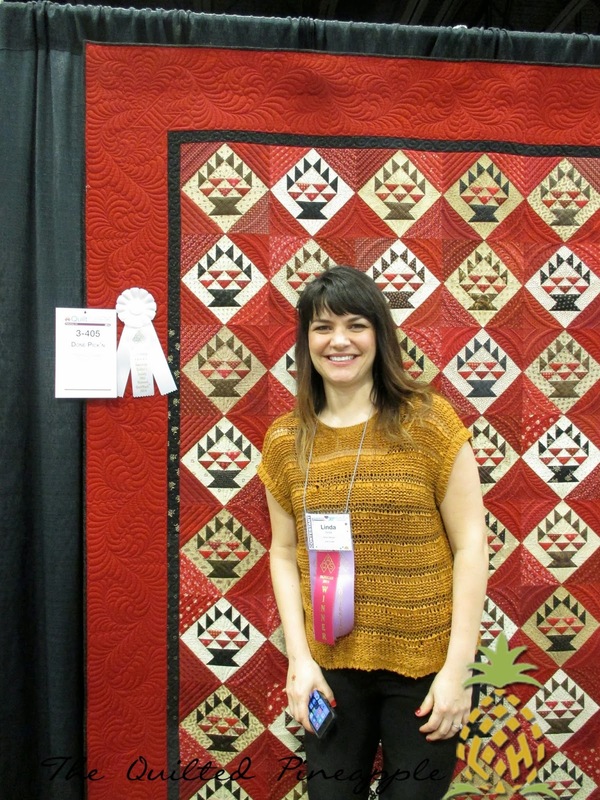 First time submitting a quilt to Paducah and winning First Place, seriously leaves me with a lump in my throat. :-) I feel like Cinderella.